Jose & Maria Barrera single-strand necklace. Mixed beads, including agate, cloisonne, carnelian, and faceted glass. With every purchase Akola reinvests 100% of profits to empower women and families in poverty. Akola long single-strand beaded necklace. With every purchase Akola reinvests 100% of profits to empower women and families in poverty. 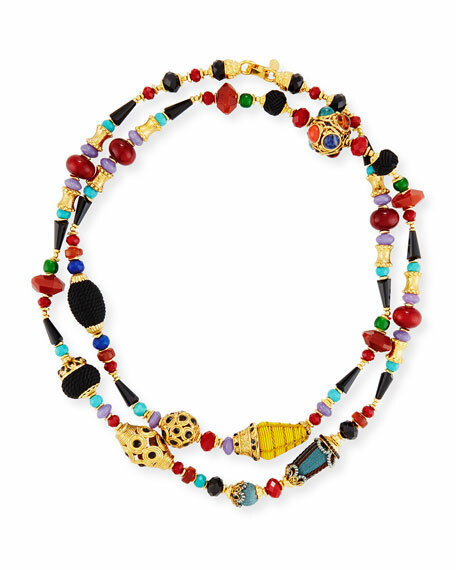 Akola long single-strand beaded necklace. Yellow golden brass accents and mixed beading. Raffia, dyed bone, jade, garnet and purple tiger's eye. Slipover style. Approx. 42"L. Made in USA. Beaded necklace by Chan Luu. Self-tie ribbon closure. Mixed beads in three strands. Beige colorway: Natural mother-of-pearl, Picture Jasper, African Opal. Turquoise colorway: Turquoise, Amazonite, White Sodalite. Approx. 20"L.
Devon Leigh mixed beaded pendant necklace. Polished 18-karat yellow gold-plated hardware. Mixed sunstone, pyrite and chalcedony beads. Golden filigree drop and teardrop pendant. Adjustable; lobster clasp. Approx. 30"L. Made in USA. 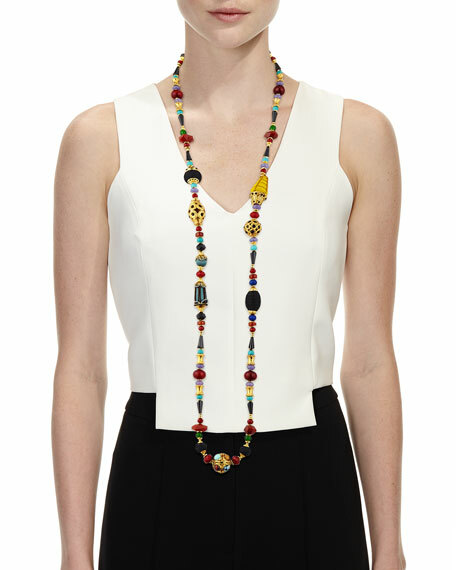 EXCLUSIVELY AT NEIMAN MARCUS Jose & Maria Barrera rose quartz long beaded necklace. Polished 24-karat yellow gold plated hardware. Mixed opal-hued Austrian crystal pav?? beads. Round, multi-size blush rose quartz beads. Approx. 46.5"L. Fold over clasp. Made in USA.